Syringomyelia has fascinated neurologists and neurosurgeons for decades, if not for centuries. The slowly progressing cystic cavitations of the spinal cord have led scientists and clinicians to various pathophysiological hypotheses and treatment strategies. Until recently, no clear concept existed as to what caused a syrinx and how and when a particular patient should be treated. The introduction of magnetic resonance imaging (MRI) has revolutionized our view of syringomyelia. For the first time, we are able to diagnose a syrinx before it produces clinical symptoms, and we can follow the course of the syrinx before and after surgical treatment with a noninvasive method. This has led to a huge amount of information not available to previous scientists. Nevertheless, pathophysiology and treatment are still contro­ versial. 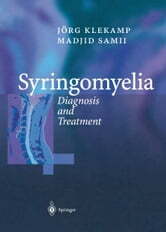 The aim of this book is to give a guideline on how to approach a patient with a syrinx. Based on clinical experience, we have modified our strategies repeatedly in an attempt to improve clinical results. We have developed a treatment concept, evolved out of 20 years of clinical and experimental work, which has proven to be a solid basis for our decision making. Clinical courses, surgical indications, tech­ niques, and postoperative results are discussed for each of the different pathologies known to be associated with syringomyelia. In this manner, we hope to give a co­ herent overview on all aspects of syringomyelia, which should help physicians to counsel and treat patients with this fascinating but also potentially devastating dis­ ease.